Since mid-August, GBP has grown against USD by more than 350 points due to weak US data and increased demand for the British currency. GBP strengthened, despite weak macroeconomic releases, which indicates a change in trade sentiment in its favor. At the beginning of the current trading week, the pair managed to overcome the upper border of the downward channel at 1.3000, but did not rise above 1.3085 and returned to the level. At the end of the trading week, a number of key US releases are expected: data on inflation, the labor market, industrial production, and retail sales. The UK will publish the decision of the Bank of England on the interest rate and the volume of the asset purchase program. 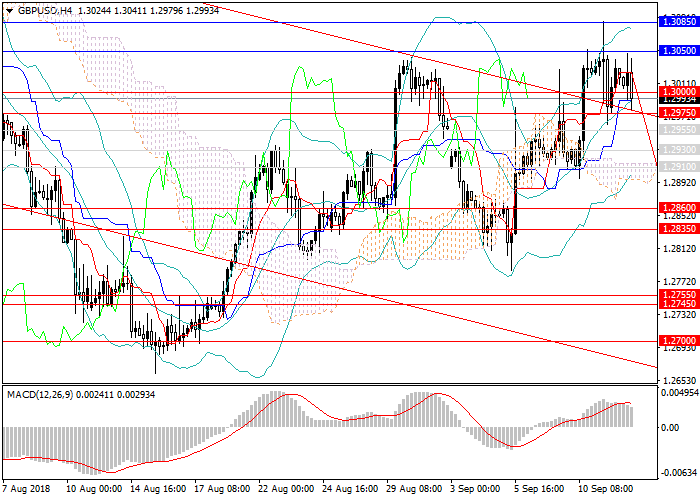 Today, low volatility is expected, the pair will consolidate within the side channel of 1.2975–13050. In the future, the instrument is expected to return to the long-term downward trend and decline to the levels of 1.2910, 1.2860, 1.2835, and tend to local lows. The growth of the second half of August and the beginning of September is a lingering upward correction, and a downward wave will form again in the short term. Technical indicators confirm the decline forecast, MACD keeps high volumes of short positions, Bollinger bands are directed downwards. Resistance levels: 1.3050, 1.3085, 1.3150, 1.3180, 1.3210. Support levels: 1.3000, 1.2975, 1.2930, 1.3860, 1.2835, 1.2745, 1.2700, 1.2640. It is relevant to open short positions from the current level with the targets at 1.2860, 1.2835, in the long term with the target at 1.2700 and stop loss 1.3120.